Jane and Dr. Herzle have made a major breakthrough in reincarnation studies, but their hard work is compromised when Jane is kidnapped! 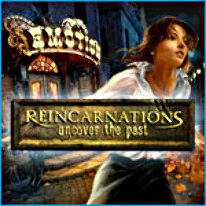 Help her explore past lives as she tries to save her own life in Reincarnations: Uncover the Past. Use your hidden object talents to take on the evil kidnappers and discover valuable clues.